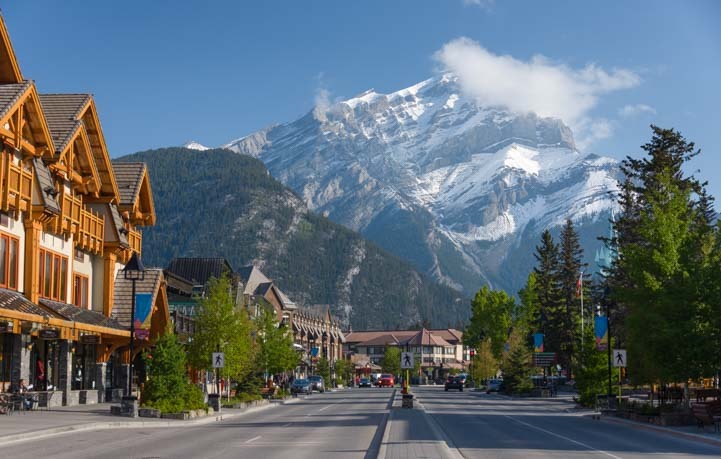 May 2016 – Banff is a beautiful and very grand resort town in the Canadian Rockies of Alberta, that sits at the base of towering Cascade Mountain. 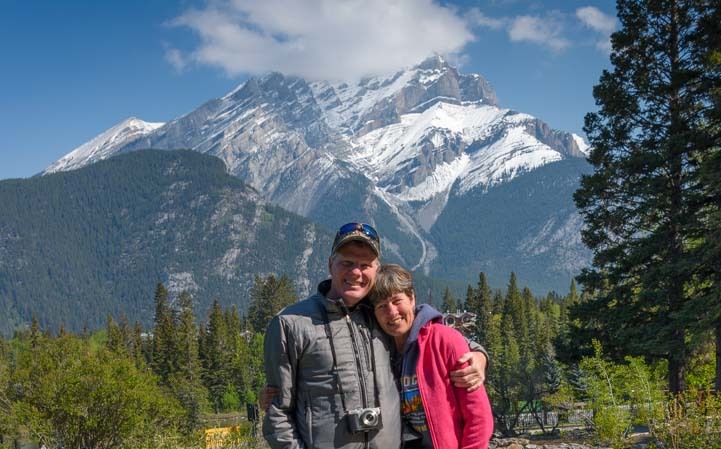 So far in our Canadian Rockies RV adventures we’d seen lots of jaw-dropping alpine scenery with gargantuan, sharp craggy mountains and breathtakingly beautiful and colorful lakes. 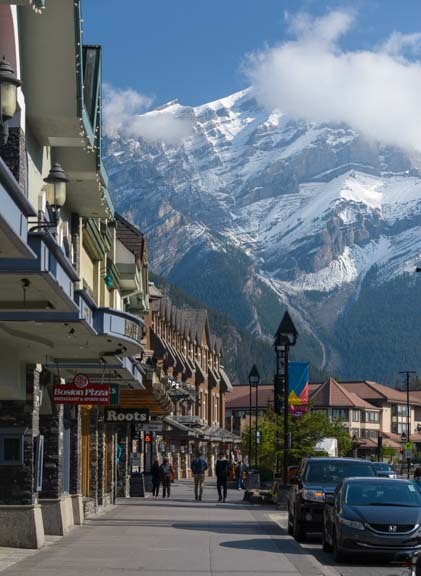 But as we strolled down the main drag, Banff Avenue, we found ourselves in the heart of trendy urbanity, surrounded by high end boutique tourist shops that line the sidewalks. Yet we were still in the heart of the Canadian Rockies. That mountain over there — oh my! — what a backdrop it made from every vantage point in town!! Looking down Banff Avenue at Cascade Mountain. 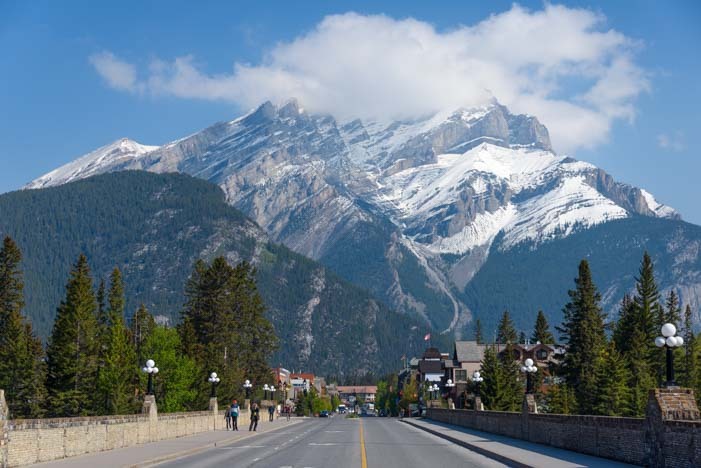 Banff has so much to offer visitors, that it is always loaded with tourists. Lots of people told us they prefer the quieter towns of Canmore (20 miles to the east) and Jasper (150 miles north), but despite the mobs of tourists clogging the streest of Banff in the afternoons and the extraordinarily expensive stores and the glitz and glam everywhere, we totally loved Banff anyway. It is absolutely delightful — especially in the quiet of very early morning! Geez, that huge mountain is a photo bomb in every shot! Being there in late May really helped with the crowds too. Parking can be a nightmare in peak season. There is an electric sign as you arrive in town that indicates how many parking spaces are currently available! And the tourist literature even gives hints on parking (Hint #1: Walk or ride a bike!). Sometimes you are sharing the road with delivery trucks and RVs, and sometime you’re sharing it with horses and buggies. Horse drawn carriages offer classy rides around town (with blankets). But we always found a parking spot for our big ol’ dually truck without a problem, sometimes sandwiched in between a bunch of rental RVs from Canadream, Cruise Canada and Fraser RV! Parking in Banff can be a nightmare, but we always found a spot for the dually… sometimes in between rental RVs! 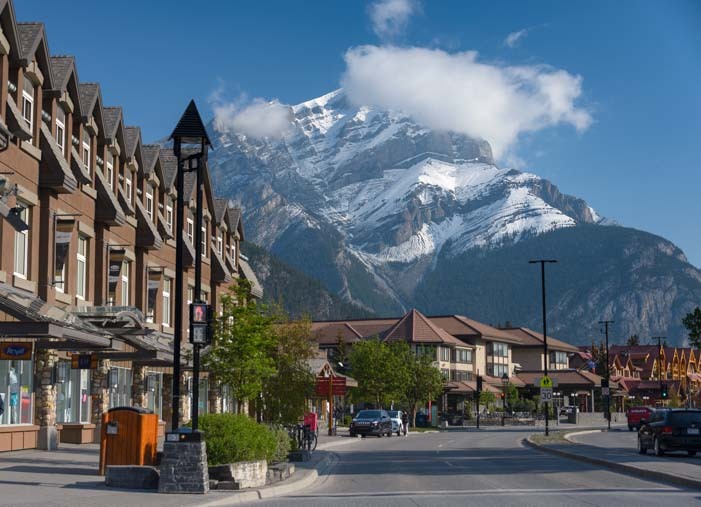 While Cascade Mountain towers over the north end of town, Banff National Park headquarters presides over the south end of town. 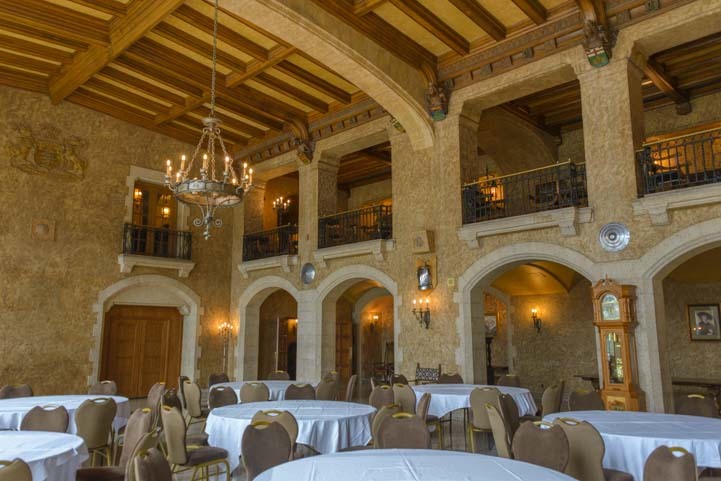 It is located in a beautiful stone building that resembles a castle. 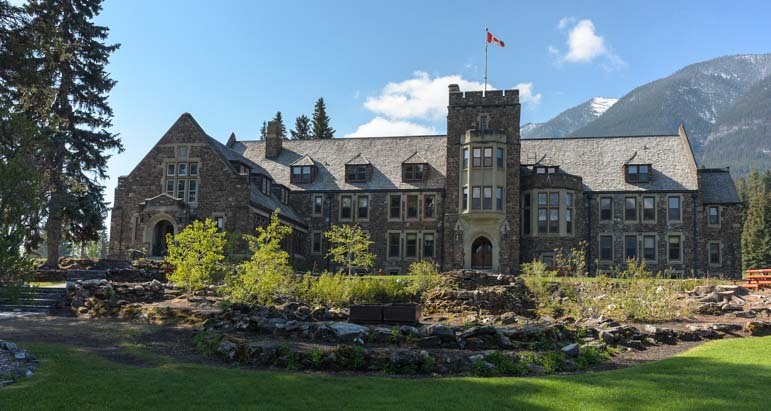 Banff National Park Headquarters… Nice! Looking back at the town from this building’s gracious front yard and garden, Cascade Mountain soared into the heavens. 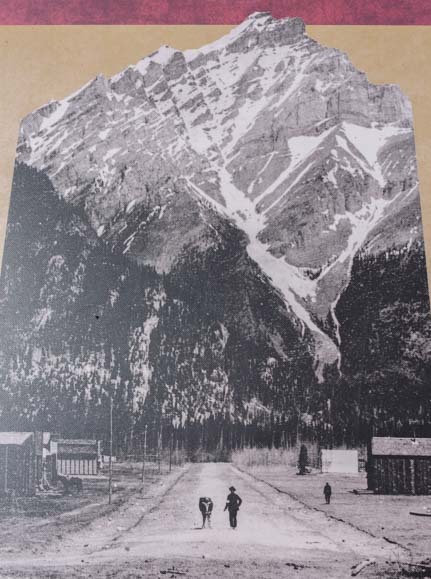 We were fascinated when we found a plaque that has a photo of Banff from 120 years ago, back in 1896. Banff was a small village then, and the main street in town was dirt. There were hardly any buildings and certainly no traffic problems! But gorgeous Cascade Mountain still towered over everything! Cascade Mountain as seen looking down Banff Avenue in 1896. What a great little town Banff must have been then and, in a different way, what a great town it is now! Cascade Mountain as seen from Banff National Park HQ. We wanted to get a bird’s eye view of the area, so we drove up to the Mount Norquay ski resort. There are some really steep switchbacks on this road, but as we climbed higher and higher we came across some big horn sheep. 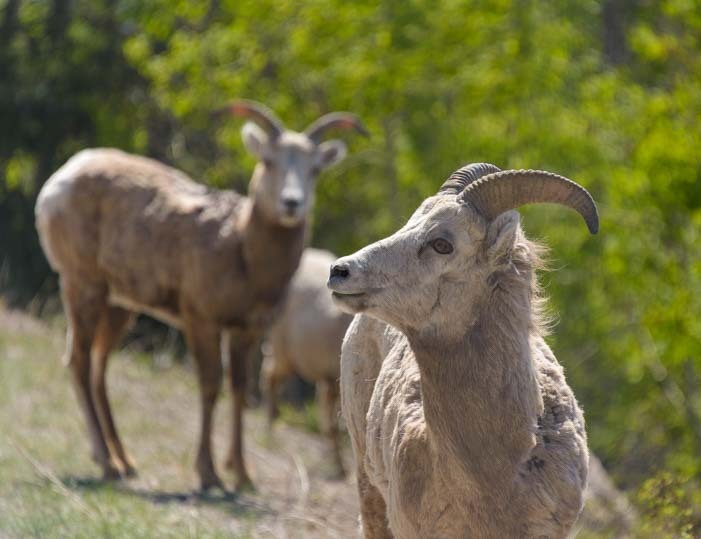 Big horn sheep greet us as we drive up the switchbacks to Mount Norquay ski resort. 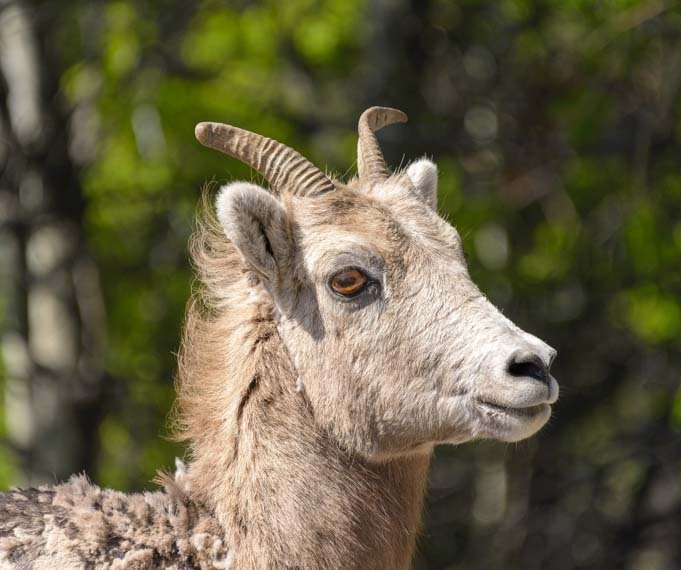 These big horn sheep sightings in Canada were getting kinda routine by now. How incredible is that?! A few months ago I’d been thrilled to see a big horn sheep up close in a zoo! We stared at them, and they stared right back. No fear! We went up to the ski resort too early in the day, and the whole view was backlit by blinding sunshine. The views up there are best in mid-afternoon or later. So we shaded our eyes and took it all in but skipped taking any photos. On another day when the sun wasn’t shining we came across wildlife of another kind in the huge salt water aquarium at the Fairmont Banff Springs Hotel. Dory’s buddy was there! 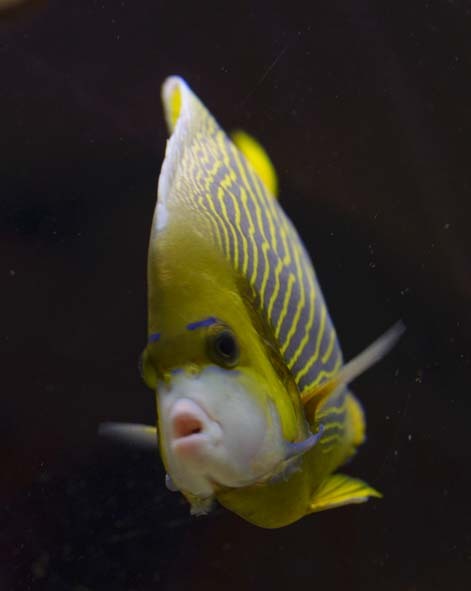 We found Dory, or her friend anyway! 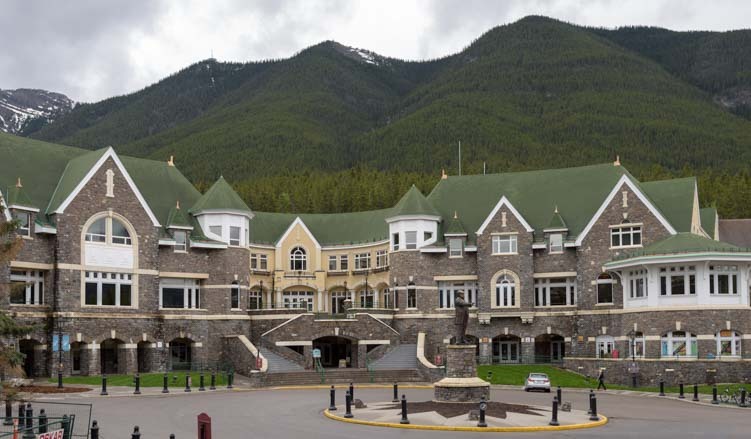 Back in Fernie, BC, when we first arrived in Canada’s Rock Mountains, the guy at the visitors center had told us not to miss the Banff Springs Hotel when we got to Banff. As we drove up to it we saw why. What a majestic and ornate building! Just like Sun Valley, Idaho, a few hundred miles to the southwest, Banff (and Lake Louise) were created as tourist destinations by a railroad company to get rich urban folks to jump on the train and go have some fun in the mountains. Sun Valley Resort was developed by Averell Harriman who owned the Union Pacific Railroad in the early 1930’s. 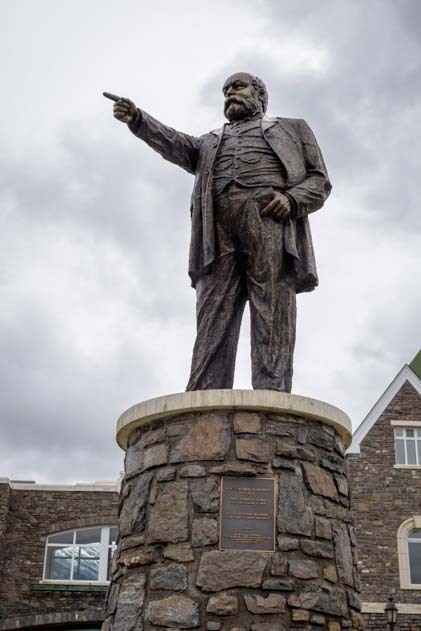 Banff was created by Sir William Cornelius Van Horne, President of the Canadian Pacific Railway Company, in the 1910’s and 20’s. These guys knew their railroads could bring people out into the snowcapped mountains for both winter and summertime fun, and they spared no expense developing their properties in the gorgeous mountains of western North America. They were after the wealthiest clientele, and they wanted to pamper them in elegant surroundings. One can only imagine what it was like to arrive from the city by train and be waited on in such a luxurious manner out in the middle of some of the most beautiful scenery on the planet! 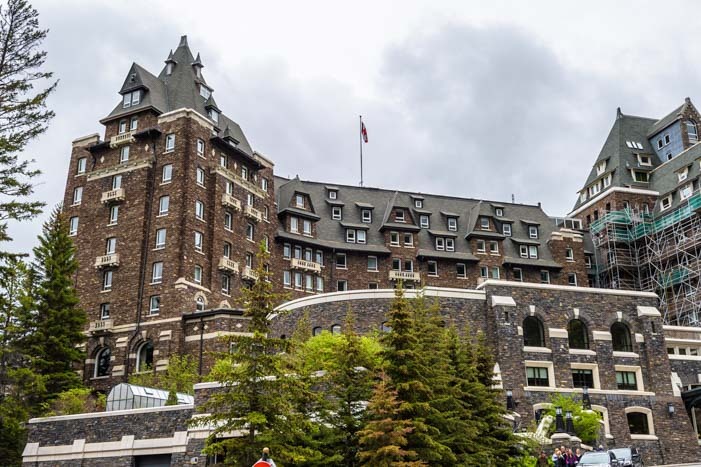 The Banff Springs Hotel is an elaborate stone structure with lots of turrets and arches. 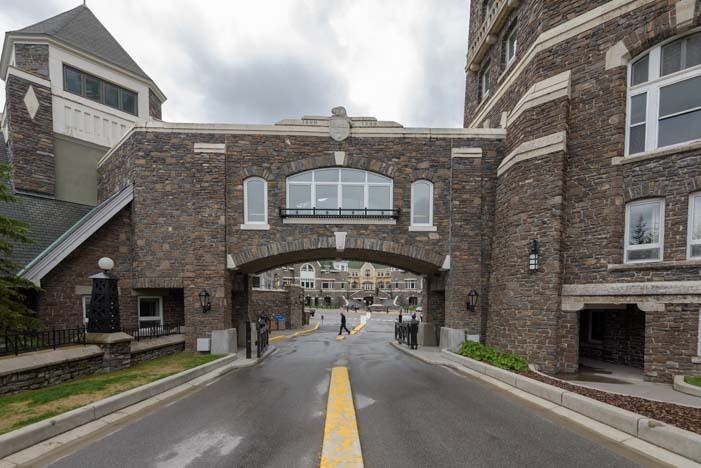 The stone building has a cool arch. 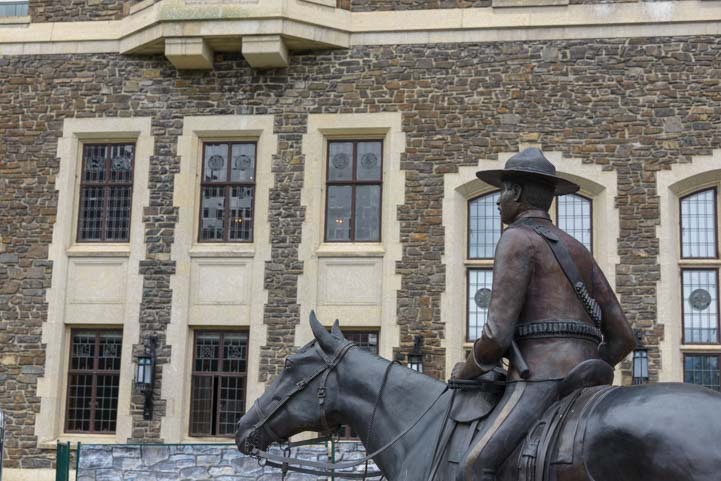 There is a wonderful bronze sculpture of a horseback rider out back. 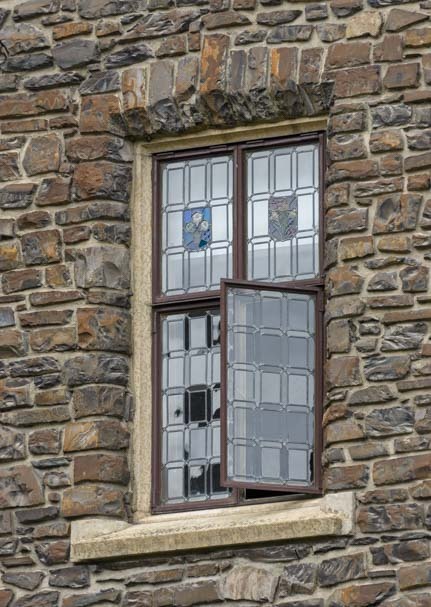 And there are beautiful leaded windows too. 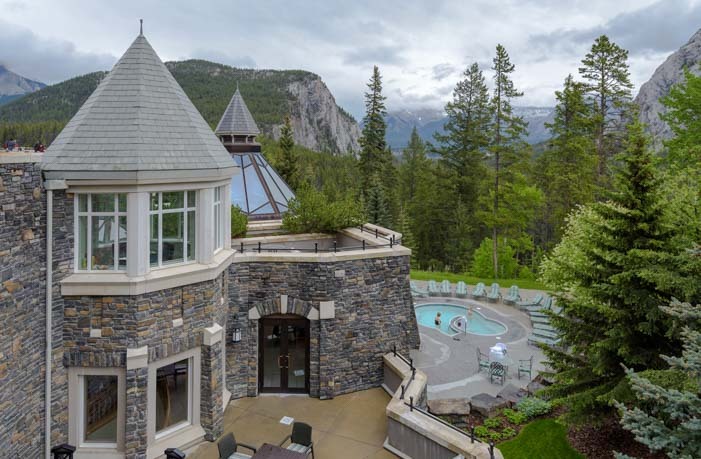 We visited Banff Springs Hotel on a chilly day, bundled up in jackets and long pants, but some die-hard hotel visitors were taking full advantage of the pool and hot tub. Inside, the lobby was lavish. Wandering around the various meeting rooms, we found some lovely stained glass windows. 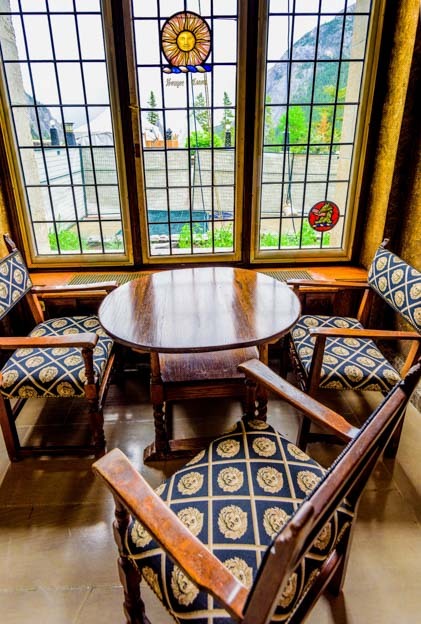 Stained glass windows and fancy chairs. And then we found a stone walled dining room with soaring ceilings. An elegant spot for dining. 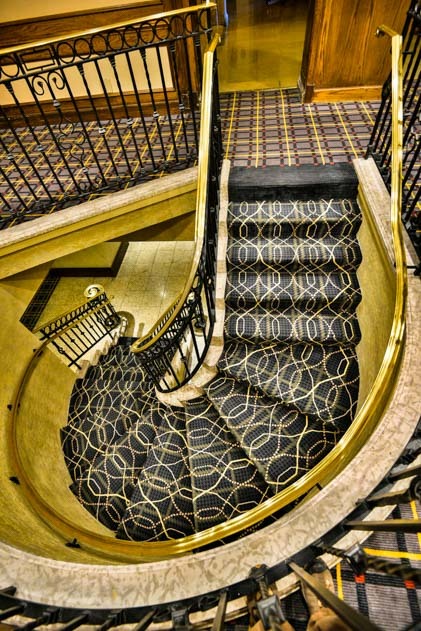 The winding staircase lured us upstairs. We were exploring all kinds of nooks and crannies in this magnificent old hotel when we suddenly came across an open door. Peeking inside, we saw two young men painting on easels. 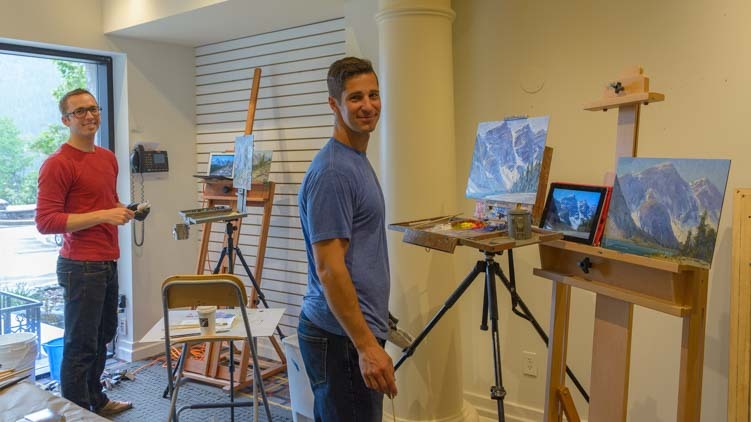 It turned out that the Fairmont Banff Springs Hotel has an Artist in Residence program, and these two men, Jason Bartziokas and Josh Clair, were the resident artists of the week. 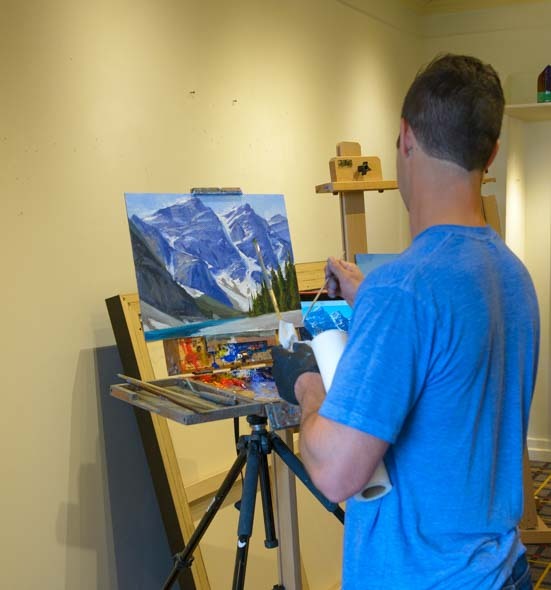 Josh is from Utah, and he explained that the program allowed them to live at the Banff Springs Hotel, paint and show their work for a week. Visitors like us could drop in on them at any time, and those with an artistic bent could study with them too. 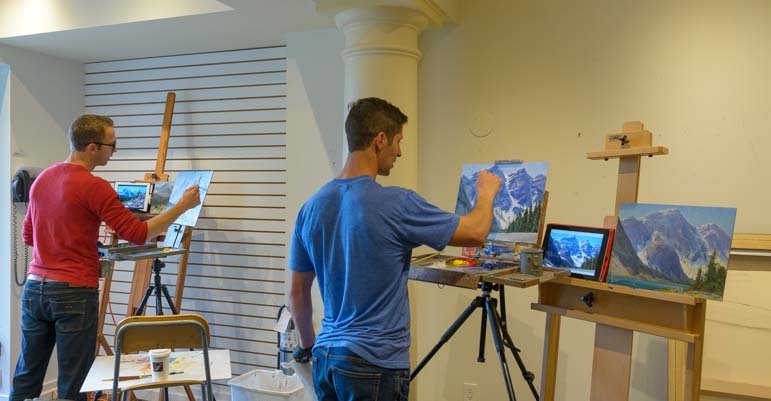 One requirement for the artists in residence is that they spend six hours a day in the hotel painting. So the two of them had been hiking in the mountains with a camera in early mornings and late afternoons and then downloading those images to an iPad to use for inspiration for their paintings when they were inside the hotel. How fun! Josh Clair hails from Idaho. I was impressed, no, I was blown away that both Josh and Jason are full-time professional artists. Budding young artists are forever being told it’s impossible to make a living making art, and a rare few dare to try and create a full-time professional career from it. But both of these men had gone to art school in the early 2000’s and had emerged to find their own path in this world as artists. Jason even supports a young family with his work. Besides his oil paintings on canvas, he has found a unique niche in the sports world (he’s a lifelong hockey fan) and is very well known for the inspired images he air brushes on hockey helmets for members of the NHL. How creative! Jason Bartziokas found a unique niche air brushing pro hockey helmets. Jason and Josh reminded me of the unique, color blind, dual paintbrush wielding artist we had met by a creek in Sun Valley where he was painting a huge canvas resting in the back of his pickup. Raised on a farm, he’d discovered a love of art at a young age, won a scholarship to art school and charged ahead. 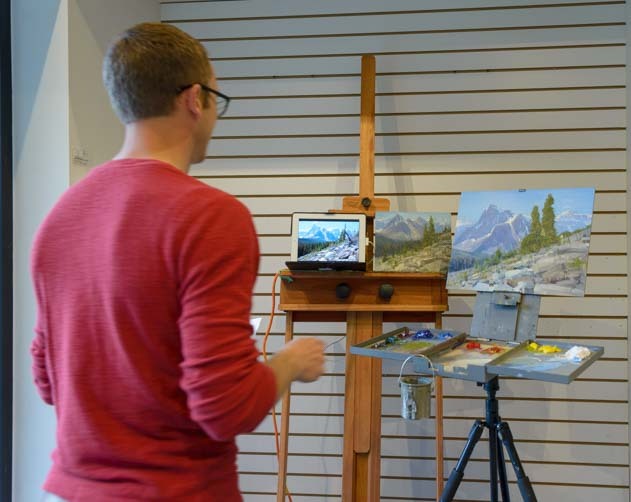 We had later seen the painting we watched him create for sale for several thousand dollars in the art gallery in town. Amazing! I mentioned this story, and Josh reminded me that this artist’s name was Robert Moore (here is our blog post about our fun encounter with artist Robert Moore). The artists hike with cameras to capture images to be painted on canvas later. Watching these two men in action in the early stages of their art careers was very satisfying. They were proof to us, yet again, that the people who pursue their passions open their lives to the possibility not only of rich rewards but of personal fulfillment as well. Professional artists who have dared pursue their dreams. Fantastic! 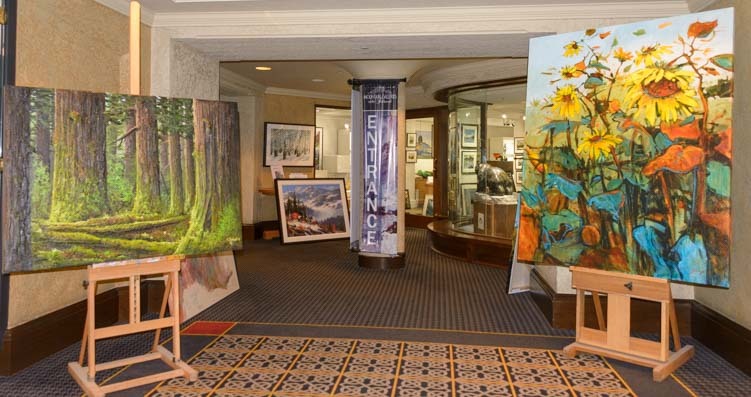 Downstairs in the Banff Springs Hotel we found Mountain Galleries which is responsible for this wonderful Artist in Residence program. They had lots of different artists’ work on display, and I’m sure that by now both Jason’s and Josh’s work from their week in Banff can be found on display there as well. Seeing these two young men happily painting away in this fancy hotel gave us both pause for thought. How easy it is to disregard our dreams, especially when we’re young and want to “get ahead.” But ignoring our dreams can become a bad habit that is hard to break as we get older. Too often we shrug off our deepest yearnings throughout our lives until it’s too late. John Lennon’s Aunt Mimi, the woman who raised him, once warned him: “The guitar is all right, but you’ll never make a living out of it.” Fortunately, he didn’t listen to her. 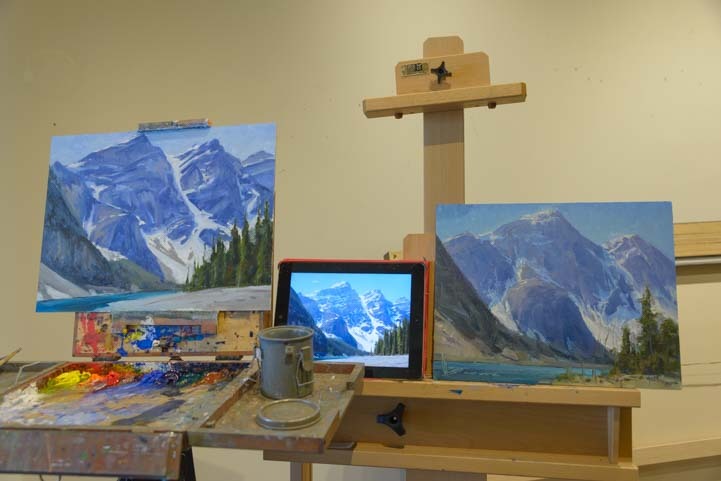 I love coming across evidence like this, not just with celebrities but in unexpected places like the Banff Springs Hotel’s Artist in Residence program, that even our wildest dreams can come true if we believe in them. Great images, as usual. You really have studied depth of field and composition as well as having a naturally good eye. I read your post about your cameras and all the research you did. Bravo. I’m so impressed with your indoor shots–did you haul your tripod inside or were they hand-held? If hand held with high ISO your camera does a much better job than mine with eliminating noise (unless you used software-which is what I do). Still, your indoor shots are so well lit and bright that it is very impressive! I can’t wait to get up there–trying to decide whether to wait until August to avoid tourists and full camping spots! Thanks, Rhonda. We have studied photography in depth and continue to learn more every day. 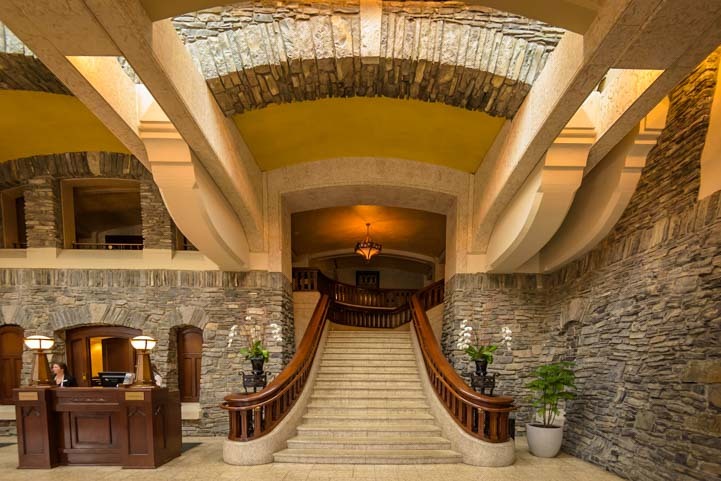 Most of the indoor shots of the hotel lobby and stairs, etc., were Mark’s on his Nikon D810 with a Nikon 16-35mm f4 lens. That’s a top of the line full-frame camera and it can go to pretty high ISO before the images start to degrade. Most of his shots in the hotel were at 3200 ISO. We use Adobe Lightroom for image processing and continue to learn more and more about it every day. Post-processing is an art unto itself, very much like darkroom work used to be in the film days!! I’m not sure you’ll avoid any crowds in the Canadian Rockies by waiting until August. The peak season is summertime when the kids are out of school. I think avoiding the crowds means being there between October and May (and of course in the peak of winter you’ve got lots of skiers in the area). We saw plenty of crowds in May!! Just go whenever it makes sense for your overall itinerary and have a blast. You can always go back at a different season another year! So glad you took your cameras! Your excellent photos are a great look at Banff, Alberta. It’s a fun place to visit, Ed, and hopefully our images give a feel for what it’s like!